This recipe is so quick and easy. Using EZ peel frozen shrimp, cleaning and preparing this recipe took less than 30 minutes to get it in the refrigerator to marinade. Carefully remove peel from the lemon half, being careful not to include the white portion. The white will give it a bitter taste. Oh the smell of fresh lemon, it's best part about preparing this recipe. Combine lemon peel, water, onion, lemon juice, oil, garlic, Cajun seasoning, and salt in a large skillet; heat to boiling. Add shrimp stirring to coat. Return to boiling. Reduce heat and simmer, covered, about 3 minutes or less until shrimp are opaque, stirring a couple times. Stir in yellow or red pepper. Transfer mixture to a glass bowl. Cover and marinate in the refrigerator for 4 hours, stirring the mixture occasionally. At serving time, drain mixture well. 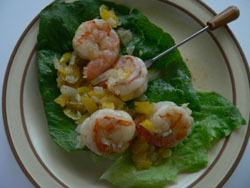 Put lettuce on a serving platter and place shrimp on lettuce with serving picks. If you are like me you have every spice in available. Why go out and by a special container of Cajun Seasoning. Here is a recipe to make your own. 2 Tbls of each paprika, salt and garlic powder. 1 Tbls of each fresh ground black pepper, onion powder, cayenne pepper. Mix all thoroughly and put in air tight container.